11th lunar month of 1694: son or adopted son of Takeshima Kôzaemon I, he becomes tachiyaku and performs under the name of Takeshima Kôjûrô. Fall 1698: Kôjûrô goes to Edo. He performs in 1699 at the Moritaza. Fall 1699: Kôjûrô goes back to Ôsaka. 11th lunar month of 1699: Kôjûrô becomes zamoto and produces in Ôsaka the drama "Daimyô Takara no Fukubiki". 11th lunar month of 1709: Kôjûrô produces in Kyôto at Kameya Kumenojô's theater the kaomise drama "Takekaburi Mangokumochi". 3rd lunar month of 1710: Kôjûrô's rank in the Kyôto hyôbanki, tachiyaku section, is jô-jô (superior - superior). Fall 1711: Kôjûrô goes to Ôsaka. 11th lunar month of 1711: Kôjûrô plays the role of the yakko Dampei, in reality Oki-no-Ishi Banzaemon, in the kaomise drama "Daimyô Hitachi Obi", which is produced by Arashi San'emon III for the nadai Ôsaka Kuzaemon. 3rd lunar month of 1712: Kôjûrô's rank in the Ôsaka hyôbanki, tachiyaku section, is jô-jô-(shiro)kichi (superior - superior - (white) excellent). He shares the same rank with Arashi Sanjûrô I. 24th day of the 11th lunar month of 1712: his father Takeshima Kôzaemon I dies. 11th lunar month of 1713: Kôjûrô plays in Ôsaka the role of Yamada Yaichibei in the kaomise drama "Saiwai Musume Takara no Yome Banzei Muko", which is produced at Ôsaka Tazaemon's theater by Shinozuka Shômatsu I. 1st lunar month of 1714: Kôjûrô's rank in the Ôsaka hyôbanki, tachiyaku section, is jô-jô-kichi (superior - superior - excellent). He shares the same rank with Sawamura Chôjûrô I. 1st lunar month of 1715: Kôjûrô's rank in the Ôsaka hyôbanki, tachiyaku section, falls to jô-jô-(hanshiro)kichi (superior - superior - almost excellent). He shares the same rank with Arashi Sanjûrô I and Sugiyama Heihachi. 11th lunar month of 1715: Takeshima Kôjûrô takes the name of Takeshima Kôzaemon II in Ôsaka at the Ônishi no Shibai, playing the role of Hige Mombei in the kaomise drama "Ugashin Kogane no Hokora"; his stage partners are Sawamura Chôjûrô I, Onogawa Ugenji, Arashi Kanshirô I, Sodeshima Genji, Murayama Jûrobê, Arakawa Jûrôemon, Sawano Hachigorô, Yamamura Giemon I and Fujimura Oginojô. 1st lunar month of 1716: Kôzaemon's rank in the Ôsaka hyôbanki, tachiyaku section, is back to jô-jô-kichi (superior - superior - excellent). He shares the same rank with Sawamura Chôjûrô I, Otowa Jirosaburô I and Miyazaki Denkichi. 11th lunar month of 1717: Kôzaemon plays at the Naka no Shibai the role of Seki no Danpei in the kaomise drama "Inari Yashiki Daikoku Bashira", which is produced by Sawamura Chôjûrô I. 12th lunar month of 1717: Kôzaemon plays in the same theater the role of Ôtsuka Hanzaemon in the kiri kyôgen "Ôsaka Shinjû Hajimari" . 11th lunar month of 1718: Kôzaemon becomes zamoto in Ôsaka, producing at the Naka no Shibai the kaomise drama "Sumiyoshi Tanjôseki", in which he plays the role of the yakko Heinai. 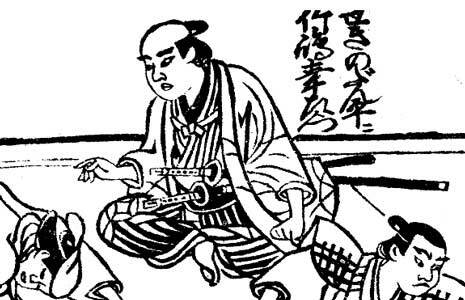 1st lunar month of 1720: first Kabuki adaptation of Chikamatsu Monzaemon's puppet theater drama "Heike Nyogo no Shima", which is produced by Kôzaemon in Ôsaka at the Naka no Shibai [casting]. 1st lunar month of 1724: Kôzaemon plays in Kyôto at Hoteiya's theater the role of Heidayû in the new year drama "Keisei Sone no Matsu", which is produced by Ogino Yaegiri I. This is his last recorded stage apperance. We don't know what happens to him afterwards. Takeshima Kôzaemon II was a popular Kamigata tachiyaku actor, who was active from the middle of the 1690s to the beginning of the 1720s. He was like his father (or adoptive father?) outstanding in budôgoto roles.